The performance of a grand opening can have a major impact on a company’s ability to generate sales within the first year of business. For the first free-standing ER in North Texas, a profitable grand opening was vital to their success. ER Alliance came to us to help create a campaign that would maximize their exposure within a designated region and develop a grand opening campaign model for future locations. The biggest challenge surrounding this campaign was maximizing exposure with a budget that was below the standard for a typical grand opening. In addition, we were tasked with all of the branding for ER Alliance. Our work began with the creation of the logo and brand guides. We then moved to the development of our creative executions which focused on digital, print and, outdoor mediums. In order to generate as much exposure as possible, we relied on a series of web banners and print advertisements in local publications to reach the target audience. We then reinforced the message with billboard advertisements and promotional T-shirts. 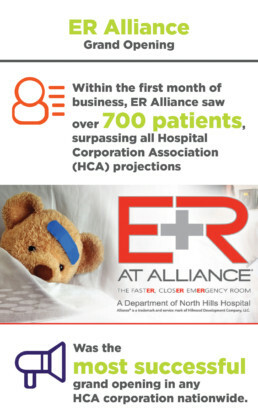 Within the first month of business, ER Alliance saw over 700 patients, surpassing all Hospital Corporation Association (HCA) projections and making it the most successful grand opening in any HCA corporation nationwide. Our campaign model was then used for every grand opening following the success of the Alliance location.